IRA contributions for the 2018 tax year can still be made until April 15, 2019. If you don't have an IRA , please stop in at one of our branches. 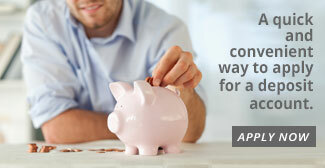 We can help you start planning and saving for your retirement. Apply Here for a Mortgage! Save time and apply for your mortgage online. Click here to apply today. Apply Here for a Deposit Account! Save time and start the process to apply for a deposit account online. Click here to apply today.